Total Locking Institutional Casters are perfect for any type of light duty caster application where the Caster must be completely stationary and immobile when the caster brake is engaged. CasterHQ's line of total lock Casters are the highest quality. Total Locking Institutional Casters are perfect for any type of light duty caster application where the Caster must be completely stationary and immobile when the caster brake is engaged. CasterHQ's line of total lock Casters consists of a proprietary locking design which locks both the wheel and swivel bearing simultaneously. 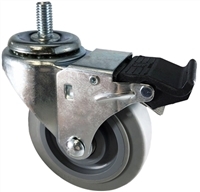 Our Total Lock brakes guarantees that the swivel caster will not turn or swivel when the wheel is locked. Total Lock Brakes are designed for safety applications that require the ability to transform your mobile equipment or cart to a completely stationary unit when needed. 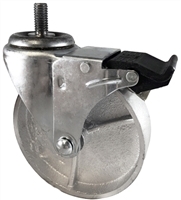 These casters are commonly used on tablesaws, medical equipment, worktables, and carts. 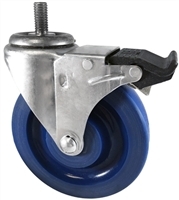 All wheels offered with our total locking casters are non-marking polyurethane or non-marking thermo plastic rubber. Polyurethane wheels are great for loads sitting for longer periods of time because of the slightly harder tread surface. If you have small debris or a requirement for a quieter, shock absorbing ride then consider our Thermo Plastic Rubber wheels. Thermo plastic Rubber wheels are great for rolling quietly due to the softer tread material. Both Polyurethane Wheels and Thermo Plastic Rubber Wheels are both non-marking and chemically resistant which includes, acids, oils, greases, water, and cleaning chemicals. Thermo Plastic Rubber is softer so do not leave the maximum load capacity on the cart for long periods of time or the wheel material could possibly flat spot. Generally speaking the material will expand back out as you continue to roll it but the initial push to initiate the roll might be slightly more difficult than a harder polyurethane wheel. Total Locks: Combination of a Brake and Swivel Lock. Only takes one step to engage the brake which locks the entire caster holding the equipment or cart securely in place. To release simply step on the brake again and the brakes will be released which frees the swivel and wheel. 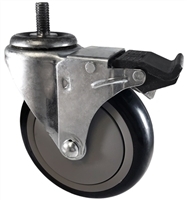 Swivel Caster Benefits: Our raceways have double ball bearings for a reliable easy swivel action, all raceways are heat treated to maximize life efficiency of the casters. If ordered before 12-noon; all orders typically ship the SAME DAY! Looking for a Total Locking Caster with a Mounting Plate? Click the link below for the Plate Version of this caster style. Shop Total Lock Casters from Caster HQ and have peace of mind knowing your buying a quality caster and wheel manufactured in a ISO:8001 Certified Facility with the highest quality control and standards in the industry. All of our products are backed by warranties because we stand behind the quality of our products.